TH E M R EP O RT | 51 O R I G I NAT I O N S E R V I C I N G DATA G O V E R N M E N T S E C O N DA R Y M A R K E T THE LATEST ORIGINATION Partner with the Law Firm Ranked as One of MReport's Top 25 Companies to Work for. 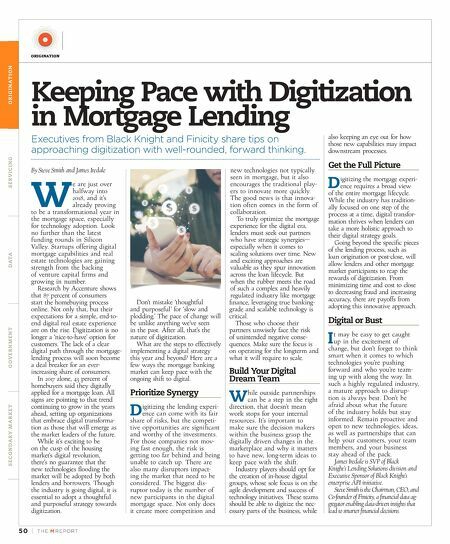 "The greatest measure realized from being a top company to work for is the satisfaction received from clients based upon the great work of your employees–happy employees lead to happy clients." 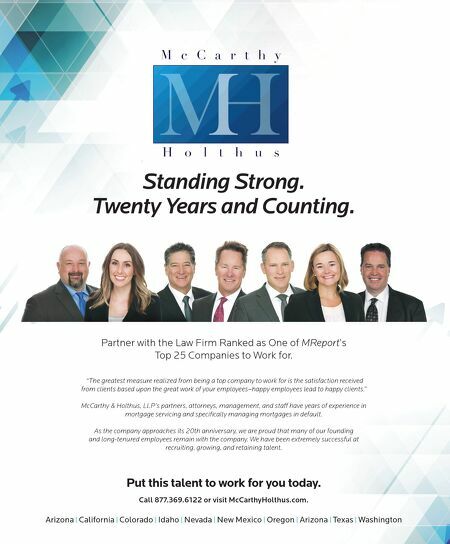 McCarthy & Holthus, LLP's partners, attorneys, management, and staff have years of experience in mortgage servicing and specifically managing mortgages in default. As the company approaches its 20th anniversary, we are proud that many of our founding and long-tenured employees remain with the company. We have been extremely successful at recruiting, growing, and retaining talent. industry leaders. Ser vice Second to None. www.mccar thyholthus.com Put this talent to work for you today. Call 877.369.6122 or visit McCarthyHolthus.com. Arizona | California | Colorado | Idaho | Nevada | New Mexico | Oregon | Arizona | Texas | Washington Standing Strong. Twenty Years and Counting.